A couple years ago, I wrote about some work from Kansas State University related to woody plant expansion in prairies. Many of us who work with prairies constantly wrestle with questions about trees in prairies. Why are they encroaching so quickly these days? What prevented them from doing that in the past? During our recent trip to Konza Prairie, we got to discuss this topic more in-depth with Jesse Nippert and other researchers at Kansas State. Clearly, a combination of factors influences how quickly trees and shrubs enter and spread in grasslands. One big reason is the increase in “seed rain” in some of today’s prairies. Prairies in fragmented landscapes with numerous trees and shrubs in nearby woodlots, road ditches, shelterbelts, etc., are deluged with seeds from those woody plants. The vast majority of those seeds fail to establish, but the high number of seeds coming in means that some will find opportunities to grow. Smooth sumac clones like this small one are expanding at Konza Prairie and many other sites in central North America. Other factors may include the higher rates of carbon dioxide in today’s atmosphere and higher amounts of nitrogen deposition (from industry and agricultural facilities, for example), both of which tend to favor woody plant establishment. In addition, we are in a relatively wet climatic period if you look at the geologic record. While there have been droughts, including severe ones, in recent years, those droughts are nothing like the multi-decade severe droughts that can be seen in the relatively recent geologic records for the central United States. Long and/or frequent droughts favor herbaceous plants (such as grasses and wildflowers) over trees. However, Jesse Nippert’s research into the way trees, shrubs, grasses, and forbs (wildflowers) compete for water belowground provides some additional insight into the march of woody plants into prairies. As we started talking about roots, Jesse confirmed something I’d heard from Dave Wedin at the University of Nebraska; even though grasses can have very deep roots, most of their water use is actually very shallow – within the top 25 cm of soil. Jesse says the reason those grasses persist during very dry periods is not because of their deep root systems, but because they can continue to grow and function when available soil moisture is very low. Forbs also pull a lot of their moisture from shallow roots, but utilize slightly deeper roots (50-75 cm deep) during droughts because they can’t compete well with the ultra-efficient fine-rooted grasses at the upper levels. It turns out that understanding root competition might help us better understand woody plant encroachment as well. 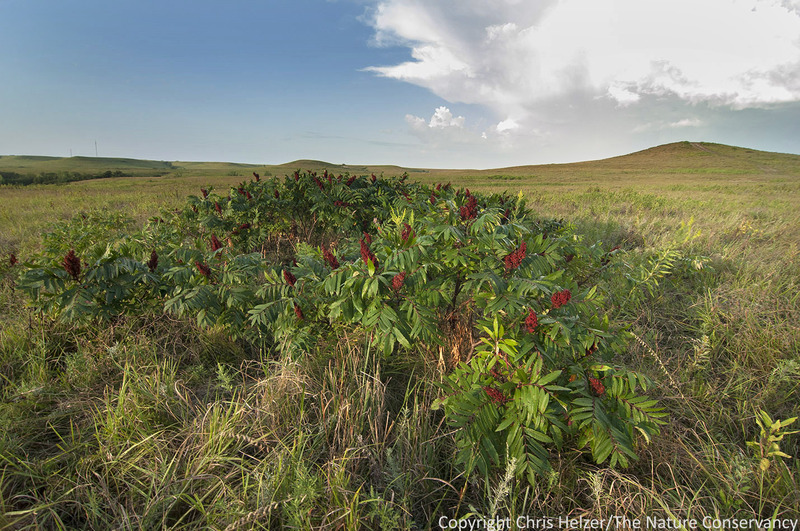 In many parts of Konza prairie, clonal shrubs such as rough-leaved dogwood and smooth sumac have expanded rapidly over the last several decades. As Jesse and his students have studied this phenomenon, they have concluded that an important factor behind this expansion is the strategy those shrub clones use to acquire water. While grasses and forbs are mostly using water from the top 1/2m of the soil, shrubs pull much of their water from deeper in the soil profile, allowing them critical access to water not being utilized by their competition – especially in years when the upper soil layers are dry. The clonal form of dogwood and sumac gives them another advantage. As clones expand, the tillers (aboveground stems) on the outer edge of the clones have very small roots. However, by studying the isotopic signatures of the water in those shallow-rooted tillers, Jesse can tell that they are also accessing water from deep in the soil profile. He says this is almost surely because the older, deep-rooted plants in the center of the clone are sharing the water they acquire with the younger stems on the outside. Not a bad strategy. Of course, as these clones of dogwood and sumac use their water acquisition and sharing strategy to advantage and spread into the prairie, they also shade out their competition – especially beneath the tall/dense tillers toward the centers of clones. Suppressing the growth of grassy undergrowth not only removes that competition for resources, it also helps make the clones fireproof. Since dried grasses are the primary fuel for prairie fires, the absence of grasses beneath shrub clones means that fires can’t burn through them. 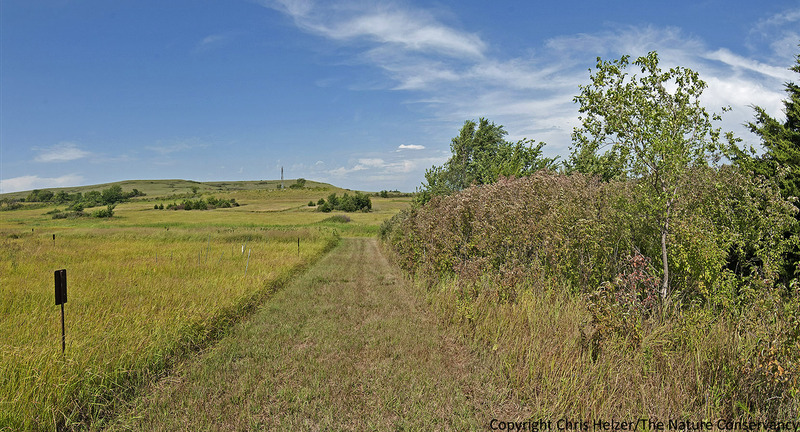 It’s not hard to see how the processes of deep water acquisition/sharing and fire-proofing can create a positive feedback loop that helps drive an inexorable expansion of shrubs into the surrounding prairie. Because much of Konza prairie has been managed under a variety of long-term fire regimes (1,2,4,10, and 20 year frequencies), Kansas State Researchers have some pretty good data on how fire frequency affects shrub expansion as well. Essentially, prairies burned every year or every other year do not have encroachment by dogwood or sumac, but prairies burned less often are being gradually overtaken by shrubs. Interestingly, the fastest expansion appears to be in prairie watersheds managed with a fire frequency of every four years (which is also about what the estimated average fire frequency was for that landscape during pre-European settlement). While it might seem counterintuitive that a four year fire frequency allows for faster woody encroachment than a 10 or 20 year frequency, the explanation appears to lie in the way shrubs respond to fire. Fire seems to stimulate radial growth in dogwood and sumac, meaning that the plants put an emphasis in growing horizontally rather than just vertically after they are burned. Under very frequent fire, this is apparently immaterial, probably because the shrubs never get enough rest between fires to take advantage of that radial growth. However, when they are given 3 years to recover between fires, that radial growth response after each fire means that burning actually stimulates faster expansion of shrub clones. Under a 10 year fire frequency, that extra radial growth only occurs once every 10 years, so the overall expansion is actually slower than in under a four year fire regime. Small research plots like these at Konza Prairie help demonstrate the impacts of various fire frequencies. The treeless grassland to the left is burned annually. The wooded area to the right is burned every 20 years. Both started out looking the same. Before you jump to the conclusion that burning every year or two seems the obvious best strategy for shrub control, remember that woody plant suppression is only one of many objectives for prairie management. I’ll address some of the other, less positive, effects of frequent fires at Konza in an upcoming post. As I said earlier, there are multiple factors that affect the rate of tree and shrub encroachment on prairies. Seed rain might be as important as anything, and climatic conditions, increases in nitrogen and carbon dioxide levels, and fire suppression are all likely contributors as well. However, the way plants compete belowground, particularly the deep water use strategy of clonal shrubs such as dogwood and sumac, also seems to play an important role. Frequent fire application can be one way to prevent encroachment, though it comes with other baggage (see upcoming post…) and may not help remove shrub patches once they’re established. At Konza, they took some of the every-20-year-fire-freuency watersheds and started burning them annually to see if they could get rid of the shrubs and trees. Thirteen years later, those patches are still there, though the individual stems are much smaller. It seems that while frequent fire might help prevent woody plant establishment, frequent fire alone might not be able to reverse it – at least not on a very fast timeline. Woody plant encroachment is one of the biggest challenges we face in prairie management today. A solid understanding of the mechanisms behind that encroachment should help us design more effective strategies to combat it. Shredding, burning and herbicide application are all useful tactics, but figuring out the timing, frequency, and intensity of those applications will be critical. We need to use the various competitive strategies of grasses, forbs, and shrubs to our advantage. As an example, some recent work by Dirac Twidwell (University of Nebraska-Lincoln) seems to indicate that burning under more extreme heat and drought conditions than we typically feel comfortable with might be one way to really tip the scales away from woody plants. The feasibility of that will be limited in some landscapes, but surely there are other innovative tactics that can help. If we work together and aren’t afraid to try some new ideas, we can figure this out.